An image slideshow is a great way of adding content to your Create website. It can be used to promote products, or show off your photography. You can create a slideshow using any of the content blocks that allow you to upload your own image. For this example, we’ll use the ‘Image’ content block. Drag and drop the Image content block onto the desired area on the page. If you click Select this will bring up a window allowing to select which images you would like to use. The images presented will be the images you have stored in the Images area under the Content option in the top menu. 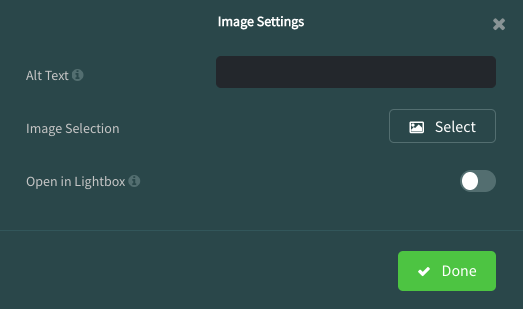 You also have the option to upload images straight from your computer. 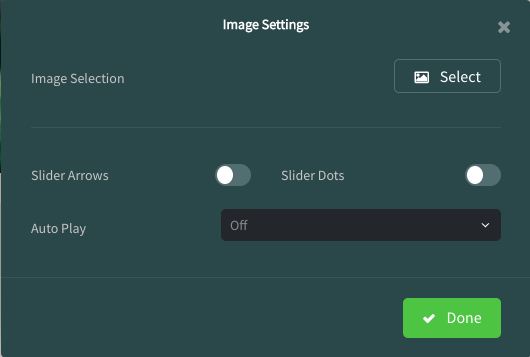 With these options, you can choose whether you would like to display left and right arrows either side of your image or even slider dots below the image - both settings allow your customer to flick through your slideshow at their leisure. You also have the option to choose an Auto Play duration which will automatically flick through your photos after a short delay.